Due to the weather forecast please join us at the MACK SPORTS ARENA for the Senior Salute on May 9th! 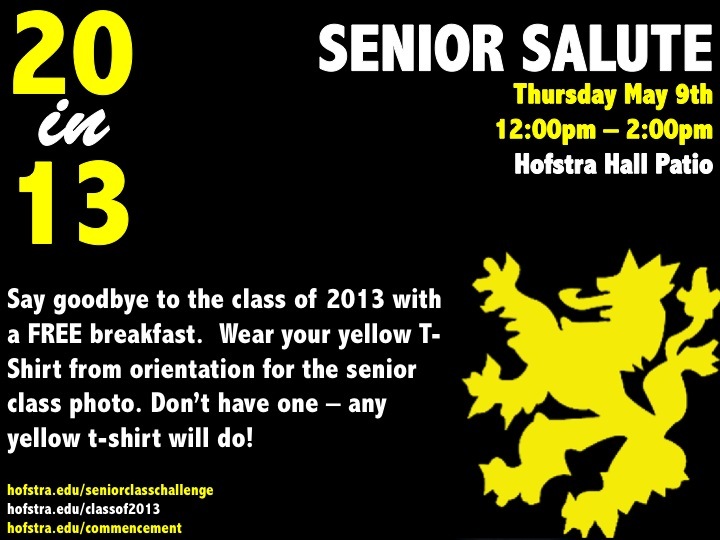 Are you a senior and thinking about what you are doing during your last weeks at Hofstra? Hopefully you have already been engaging in programs like Senior Seminars and Senior Week! I am hoping that you also are ready to tackle the 20 in 13 checklist developed by the Senior Class Challenge Committee. I am most looking forward to the Senior Salute planned for May 9th where not only will the senior class get to wear their yellow shirts from Orientation for a Class Photo (outside Hofstra Hall at 12pm) but, the underclassmen will get an opportunity to send you off outside the Adams Playhouse Quad while having a light breakfast, playing games and taking photos! Check out the 20 in 13 Checklist from your Senior Class Challenge Committee...and we hope to see YOU at the Senior Salute!